East Fife’s Pat Slattery says the team can be proud of their efforts, despite being knocked out of the Scottish Cup at New Bayview on Saturday. The midfielder says the 1-0 defeat to Partick Thistle was tough to take, as he felt that the Fifers were the better side and with a slice of luck and better finishing, could have at least taken the tie to a replay. “I felt the boys did really well,” he said. “We should have probably taken at least a draw and got a replay. “Over the course we were probably the better team so we’re disappointed. “But that’s credit to ourselves because we’ve set high standards this season. 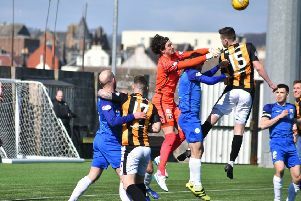 The Fifers have a good record against full time teams of late, and once more gave a good account of themselves against a team from a higher division. “I think that’s just down to the talent in the squad,” Slattery said. “We all know what each other’s style of play is. “We’ve got a good squad and a really good home record this season. “The gaffer said before the match we’ve been beaten here once in the last nine games against a full-time team, so we don’t fear anyone. “We trust our own ability and we just give it our all. “We have a togetherness which comes from good results. “We build on every good result that we get and take confidence from everything. Slattery says he is looking forward to tangling with Championship opposition once again in Friday’s Irn-Bru Cup semi final against Ross County. He said: “It’s a great opportunity for us to get into a final.